Ann M. Augustine’s debut collection of 22 short stories of family life is a superb mix of curiosity, yearning, and rebellion. 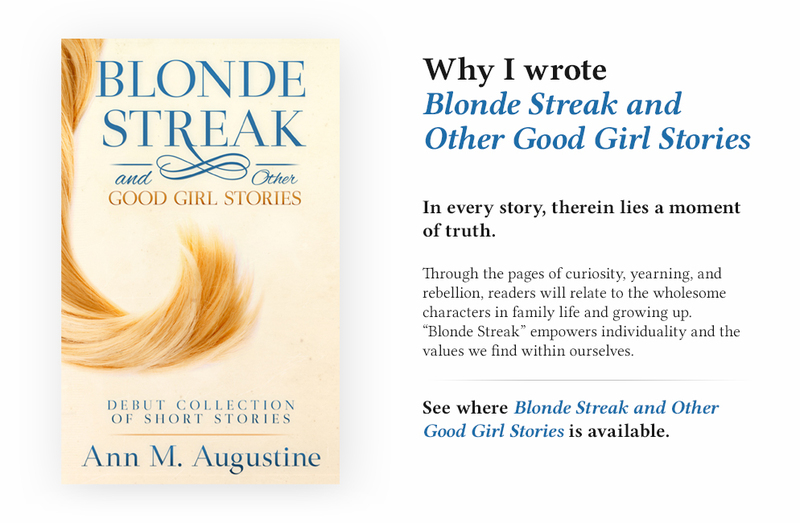 Blonde Streak and Other Good Girl Stories depict a young girl discovering her individuality and how to make sense of her world. Readers will relate to finding their own identity versus the expectations of others. The good girl in “Blonde Streak” presses on an adult theme, the boundaries that test her naivety. The emotional honesty in the story of “Socks” is a lifetime lesson in what really matters. Ann M. Augustine paints a picture of imaginative “Invisible Hands” that illustrates what happens when you follow your heart.